Certainly the Young Henry could not have remembered his first Christmas (1154) which he spent with his elder brother, William and his parents at Bermondsey, London just days after their magnificent coronation (he was definitely there, albeit incognito, still residing in his mother's womb at the time) and also the next one (1155) at Westminster when he was two months shy of his first birthday. But he must have remembered his last Christmas- although he did not know it was going to be the last of course- at Caen, Normandy (1182), being, according to the History of William Marshal, the greatest assembly of Henry II’s reign. Over a thousand knights attended. As Roger of Howden reported ‘the said king of England was at Caen, in Normandy, on the day of the Nativity of our Lord; the [young] king also, and Richard and Geoffrey, his sons, and Henry, duke of Saxony, and his wife, together with their sons and daughters*, and a large retinue, together with Richard, archbishop of Canterbury, and John Cumin, archbishop of Dublin, and many bishops, earls, and barons were there with him...' The Caen celebrations were the true family reunion, with only one notable absentee, Queen Eleanor. The latter was still her husband’s prisoner at the time and spent Christmas in England (I do not count two of Henry and Eleanor’s daughters Eleanor and Joanna married off to Alfonso VIII of Castile and William II of Sicily). The family reunion it might have been but it was also a great social meeting and general display of wealth, power and generosity aimed at enhancing the reputation of its royal host. Unfortunately it all ended up in public quarrel and renewed rift within the family that would lead to the war between the Young King and Geoffrey, Duke of Brittany on one side and Richard, Duke of Aquitaine and Henry II on the other. For the time of the midwinter feast Henry the Young King had his great hall decorated with the evergreens. Little has changed since the 12th century for the evergreens were mistletoe, ivy, and holly, the latter two borrowed from Celtic and Nordic traditions. Mistletoe, because of its pagan associations was forbidden in churches. Henry also had the floor strewn with fresh rushes. The chief decoration of the high table was the wild boar’s head, the crowning of Christmas feasts and other festive dinners of the nobility. There were at least two wild boar’s heads in the course of 1170 and both of them the Young King must have enjoyed immensely. The first, served by his father in person at the young Henry’s coronation banquet (14 June 1170) went down in history in the famous anecdote which probably delighted Henry the Elder but shocked all the others. The second must have been served the same year at Winchester, where the freshly-crowned Young King held his first Christmas Court ever. 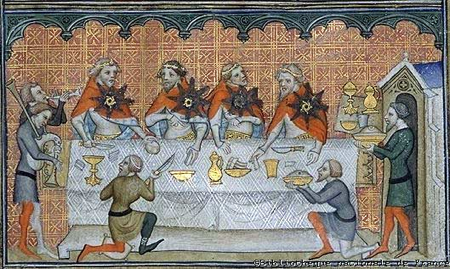 With his father away in Normandy Henry presided over the high table and all the revelries and entertainment that the members of his mesnie must have enjoyed. Henry the Young King did not get presents for Christmas. This had to wait till New Year’s Day. Deeply religious character of medieval Christmas meant praying and mass attending. The mass was central to celebration of the Nativity which meant that Henry the Young King might have attended three masses on Christmas Day. The first at midnight, so called the Angel’s Mass, the second at dawn, this was the Shepherd’s Mass and the third, the Mass of the Divine Word, during the day. There were also other religious feasts during the Twelve Days of Christmas. On 26th December the feast of St. Stephen, the first Christian martyr, and on 28th Feast of the Holy Innocents to commemorate King Herod’s slaughter of thousands of children in the attempt to kill the baby Jesus. Despite its religious character medieval Christmas was first and foremost the occasion for socializing. The revelries and entertainment varied, especially when the king was young and vigorous- and Henry certainly was- with head full of mischief and frolic. In 1171 when the young Henry held his first Christmas court in Normandy (Bur-le-Roi) he came up with a brilliant idea to dismiss all those not named ‘William’ from one of his feasts, which still left him with 110 knights and barons, William being the commonest Norman name at the time (I can imagine Henry calling: “Non-Williams, out!”)**. Dancing, merrymaking, singing, storytelling, hunting and hawking were all common entertainments. The latter the Young King enjoyed immensely, especially during the aforesaid Winchester Christmas Court in 1170, for earlier in the year he had received two new hawks as a coronation gift from his father. Speaking of Henry II, he had a man called Roland summoned each year for Christmas to fulfill quite an extraordinary duty. Young Henry must have seen for himself how Roland made a leap, a whistle and a fart. Except for irreplaceable farter there were also- and here let me quote Peter of Blois- 'minstrels, prostitutes, dice-players, flatterers, hucksters, nubulatores (probably meaning ‘clowns’), actors, barbers, buffoons, story-tellers and harpers'. In such a company Christmas must have been a joyous occasion indeed. * Henry the Lion (1129-1195), Duke of Saxony and Bavaria was the Young King’s brother-in-law, husband of his sister Matilda (1156-1189). Together with his family he had been exiled, his lands confiscated. They were all forced to seek refuge at the court of Henry II. Medieval Celebrations by Daniel Diehl. Stackpole Books, 2001. Food in Medieval Times by Melitta Weiss Adamson, Google Books. The Kings and Their Hawks by Robin S. Oggins. Yale University Press, 2004. I really have to look into Christmas celebrations in Germany at the time. As I said in a comment on my blog, I got the impression that in Germany, Easter was the more important festival, and always accompanied by a big diet (those were more important in Germany, I suppose, because the nobility had more power because the king was - well, sorta - elected). Getting the whole lot together during Easter should give the king a chance to sort out some problems, though it also happened that new problems were created (I look at you, Otto the Great and Heinrich IV *grin*). Thanks, Gabrielle. That's very interesting. I know nothing about German medieval Christmas traditions. Although I know how much the theatre owes Easter celebrations in Germany and one Hroswitha :-) It somehow confirms that in Germany Easter was more important than Christmas. I saw 'The Lion in Winter' last year and the stage was decked out in beautiful evergreens etc. It was wonderful to think this might have been how the palaces looked. Yes, it must have been all wonderful. The decorations, minstrels, actors and even Roland the farter :-) It's a pity Henry did not live long enough to celebrate more Christmases. Happy Christmas to you Arenje!